Moving your old R&D data management tech to the cloud? Although moving to the cloud is a big step for all organizations, it doesn’t need to be a daunting one. 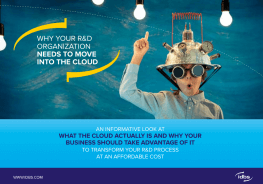 Our informative eBook talks you through everything you need to know about all things Cloud and explains why more and more customers, of all types and sizes, are taking advantage of cloud-based solutions. Don’t be held back by legacy R&D tech.